It’s time for the 4th Annual YA Superlative Blogfest! Jessica Love, Tracey Neithercott, Alison Miller, and I hosted this interactive blogfest in 2011, 2012, and 2013 with the hope of highlighting our favorite YA novels, covers, characters, and story elements, and we can’t wait for another week dedicated to promoting awesome young adult books! 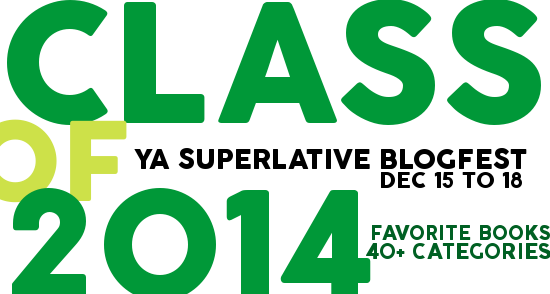 The Class of 2014: YA Superlative Blogfest will run Monday, December 15th – Thursday, December 18th and will highlight favorite YA books published in 2014. Post about your selections on your blog, Tumblr, Instagram, or any combination of those. We’ll conclude the week by giving away 2014 books to a few lucky blogfest participants (more info soon!). The Class of 2014: YA Superlatives Blogfest is all about promoting extraordinary novels. Don’t worry if you don’t have a book to fit every category, or if your 2014 reading list is on the short side — we hope you’ll participate any way you can. HERE is a fairly comprehensive list of 2014 YA titles in case you’d like to fit in a few more books before December 15th. Please do help us spread the word by grabbing our banner and/or button (both designed by crazy-talented Tracey Neithercott). We hope you’ll join us for the fun! Hey Katy, remind me how this works— do we just post a picture of the book cover or post the title of the book next to the category? Thanks. I’m excited! Oooh I really enjoyed this last year! I’m looking forward to participating (hopefully) and seeing everyone’s choices. Yay! Can’t wait to see your choices, Sophia! Oh I can’t wait to see everyone’s choices and get some great recommendations!